the markets of the old medina, where we began gathering ingredients for our feast. These streets are almost always thronged with overburdened mules, local women on their daily family grocery run, wide-eyed tourists, and the ever-present faux guides who pester foreigners for an opportunity to lead them on tours of the markets. The colorful butcher's market (سوق الڭزّارين) dominates the souqs at the head of the old city's main shopping strip. Blood is in the air here, its pungent odor dulled (thankfully) by the nearby spice sellers. In each stall, a motley variety of animal parts hang from meat hooks, being slowly nibbled away by the butcher's knife throughout the day. Gruesome bins of livers, brains, and paired feet of all species line the countertops, while cow stomachs hang above like bleached, deflated octopi. In fact, a few seafood stalls are interspersed among the butchers—a curiosity in an inland mountain city. Underfoot, opportunistic alley cats dart at fallen scraps, while rabbits and doves cower in their crates. Sanitary conditions aren't the best—Jacqueline winces each time I remind her of my rule of thumb for shopping here: "If it's good enough for the flies, it's good enough for me." Yesterday morning, my friend Sam and I spoke with a jovial poultry seller to reserve a turkey, and returned in the evening to see it meet its end. After that, we picked up some ground meat for our stuffing at the camel stall (unmistakable thanks to the distinct head always hanging out front). I had already spent an hour that morning combing through the fruits among the nearby produce sellers, and hauled home four pomegranates, a six-pound sack of chunky quinces and a similar one of clementine oranges, plus two handfuls of raisins and a few warm flatbreads. "Sept. 22: two cucumbers, two pounds of potatoes, three green peppers, five large oranges, four bananas for 20 dirhams [$2.50]." "Sept. 25: ten large eggs (freshly laid by chickens behind the counter) for 10 dirhams [$1.20], plus clementines for 3 dirhams a kilo [$.18 per pound]." Even when I can make out the sellers' mumbling over the hubbub of the market, understanding how much to pay for food is still a challenge. Many in the medina—particularly members of older generations—treat the basic unit of currency, the dirham, as an imposition, and prefer to haggle over prices in the smaller units of bygone days. Sometimes they divide a dirham into 100 francs, a.k.a. centimes. When a shopkeeper's price seems 100 times higher than it should be, I know we're talking in francs, and can bargain right back with ease. However, when they revert to riyals, a twentieth of a dirham, negotiations get confusing quickly (which I sometimes can't help but suspect might be their intention). Crowded, smelly, confusing, resistant to change—that's the medina. But for fresh local ingredients, it can't be beat. Marjane seems a world away. 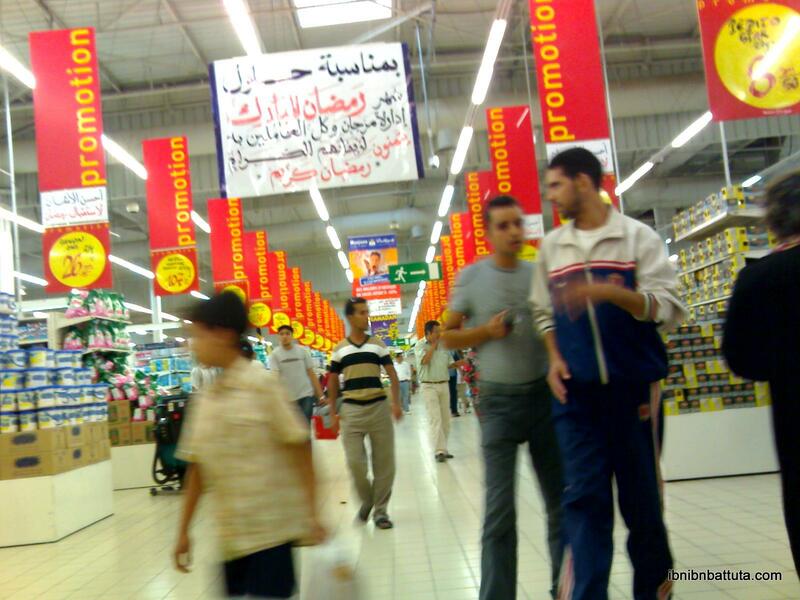 The "big box" format store, located in the furthest outskirts of Fes, is Morocco's answer to WalMart or France's hypermarchés. An enormous edifice fronting onto an equally excessive slab of parking lot, Marjane (مرجان, pronounced mar-jaan) is a little slice of America's suburban wasteland in the heart of a very traditional country. Moroccans, particularly the elite, have adapted to it quickly, and the chain does bustling business. Besides food, everything from household appliances to school supplies to clothes to basic furniture are available, most of it cheap Egyptian- and Chinese-made goods. The prices are fixed, everything has a barcode, and it's all neatly shelved in brightly lit aisles. They even take Visa. I still shake my head in amazement each time I walk in; the contrast with the old city couldn't be sharper. While Marjane may not be able to compete with the local markets in terms of food freshness, it makes up for it with a wider variety. Anytime we plan a non-Moroccan meal, we inevitably need to make a Marjane run to pick up Western ingredients. Crackers, cereal, ice cream, along with European cheeses, butter, and wines, are in abundance. Unfortunately, cranberries and canned pumpkin were too much of a stretch. It's strange to sit in a café at Marjane (like American "big box" stores, Moroccan ones come with built-in eateries, too) and simply observe. Moroccan men in flowing djellabas, women with their heads covered in hijabs and even some with Berber face tattoos walk by, pushing shopping carts filled with neatly bagged groceries. Is this the future of Morocco? I often wonder. It's clear from Marjane's success, and Fes' suburban sprawl, that the country is headed in this direction, for better or worse. But while a certain growing segment of the population may favor the convenience of the hypermarché, nobody is about to bulldoze the medina's markets to put in a Marjane. For now at least, the foreigners may pick up Thanksgiving ingredients here, and the local elite their fancy French products, but the proud residents of Fes's old city seem happy to shop just the way they've always done it, thank you very much. Nice blog entry! I did the random post button and stumbled upon this. I like learning about daily life activities like going to the grocery store and appreciate that you put Arabic in the content. Recently over dinner, my friends and I discussed that in Cuba people had to go to many markets just to find simple things like eggs. Was that the case at the Moroccan supermarkets?